When Gavin and Fiona Breeze decided to sell Fiona’s traditional farmhouse and build a contemporary home from scratch, they embarked upon a journey to create a complex and beautifully designed home. The whole project took nearly three years to complete and the design required heightened supervision of the build by the project architect. 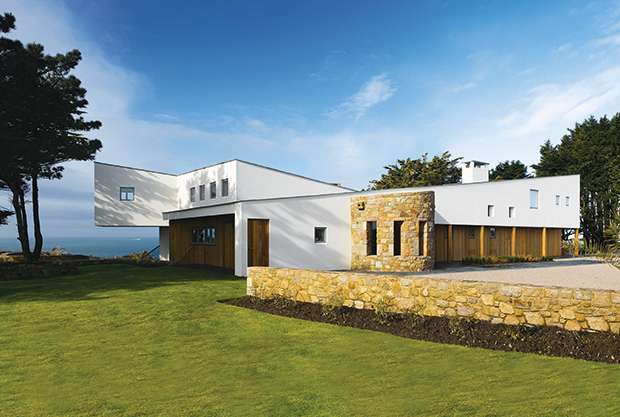 The new home now stands proudly, but unobtrusively, over St Ouen’s bay, Jersey — an Area of Outstanding Natural Beauty. We featured the home in our Daily Telegraph Homebuilding & Renovating Awards 2013, and it won the title of Best Contemporary Home. Gavin and Fiona found an amazing site containing a drab bungalow, which had amazing views over the Jersey coastline. Being in a conservation area, any project on the site would need to be approached with care. 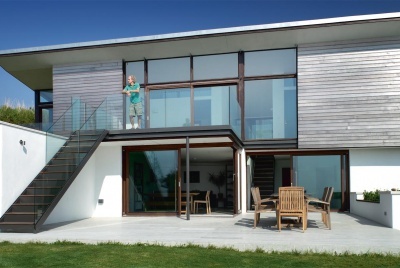 The couple knew that the special site required a top residential architect, so they appointed Anthony Hudson — designer of the award winning Baggy House in Devon. Their aim was to create an open plan family home, with private areas for individual use. They also wanted the home to be modern in design, but not overtly high-tech. The interiors are thus finished to a high standard, but the one exception to their “no Bond-style gizmos” rule is a flat screen TV which retracts into an oak cabinet in their private sitting room. The Breezes rented out the bungalow while they worked on the design with their architects. The sloping site gave them the opportunity to take a increasingly more popular approach and put the living areas upstairs. However, the open plan house does not have a conventional upstairs/downstairs layout, as the rooms are interconnected and differentiated by small changes of level and shape to create distinct spaces. This means the family can enjoy a friendly open atmosphere, but there are little retreats for privacy. The living areas have large picture windows, framing views out to see and the garden. The bedrooms and living spaces are also offer access to the extensive outside areas and, on the upper level, a large terrace. Guest and family bedrooms occupy the lower level and can be closed off from the open plan space. On the upper level is the couple’s master bedroom suite comprising of a bathroom, snug and a library. At the opposite end of the upper level is Gavin’s office which dramatically cantilevers outwards for a ‘crows nest’ effect. This is a home which has been designed around the views out to sea. The interior design is both contemporary and traditional. Exposed granite walls, oak beams and columns, and handwoven textiles contrast with more contemporary steel and glass, as used for the stairs to the office. This helps to create a scheme which is unified with segmented areas for relaxing. 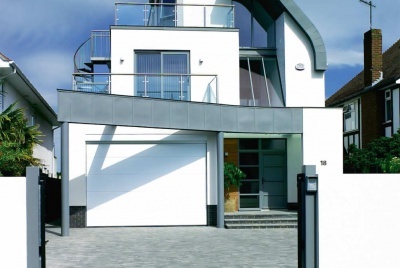 Just as a range of shapes, materials and styles have been used inside, the exterior is equally eclectic. The striking white rendered building is cut with timber cladding, and the entrance elevation contains a timber collanade punctuated by a stone hallway which references the Martello towers that are dotted along the coast. The planners were helpful and encouraged a modern design. The biggest restraint was that they could not exceed the roof ridge height of the original bungalow. The sloping site and the elevation of the original bungalow helped them, but they still had to excavate 2.5m down to prevent the house from dominating the surroundings. Project architect, Janet Dunsmore of Hudson Architects, joined the team after planning consent had been granted. She visited the site every two weeks for the three year duration of the tendering and construction. As nearly everything was bespoke, the builders required frequent clarification of what was involved. With so many traditional materials being used in non-standard ways, Janet was on the phone nearly every day to the site agent. The builders put in over 1,000 Requests for Information (known as RFIs) which demanded more detailed drawings of specific details from the architects. However, the contractors duly delivered and became used to the way of working which involved numerous tweaks on site. Gavin and Fiona also helped, taking passion in the design to ensure something really special was created. The whole house is highly energy efficient. It is built from insulated concrete formwork (ICF) which consists of polystyrene blocks, locked together and filled with concrete. 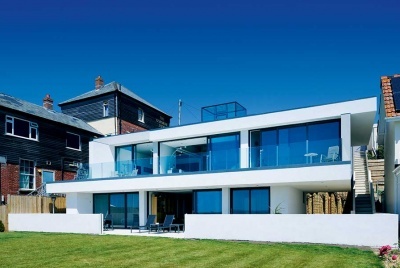 The exterior is then covered with an insulating render from Envirowall — a sillicone based system well suited to coastal areas. The roof is made from Kingspan insulated panels with natural slate on top. The whole roof then acts as a large gutter, channelling water down a single downpipe to a rainwater harvesting system.